The business environment has become extremely competitive while the pace at which businesses have to change has increased. This is resulting in tremendous pressure on IT organizations. In addition to managing the complexity and integration of older and newer technologies, IT organizations are expected to manage reduced turnaround times for new applications with reduced budgets. The price of failure to deliver high quality application on time and on budget has never been higher. Traditionally IT organizations relied on internal software developers to ensure high quality applications. As media pundits question whether IT matters, business decision makers have looked to cost cutting in the IT budget, with less value placed on large application development efforts. With advances in network connectivity worldwide, IT organizations can now take advantage of cheaper labor from offshore development companies. But this is not always a silver bullet. Differences in culture, varying approaches to development, knowledge transfer and other issues can lead to unexpected failures and cost and schedule overruns in offshore development projects. Neither using internal development staff, nor blindly sending development work offshore is the answer. INJ SOFTWARE SOLUTIONS has adopted application development best practices for both offshore and onshore development. Determination of whether to use a managed offshore development approach, offsite development or partnered onsite development can be critical in making an application development project successful in meeting financial, business, and schedule objectives. The INJ SOFTWARE SOLUTIONS application development process is based on the same fundamentals whether performed onsite, offsite or offshore. INJ SOFTWARE SOLUTIONS approach to application development starts with a comprehensive Project Plan with several phases for major project deliverables. Each phase will have several high-level work activities, which can be broken down into the specific tasks. INJ SOFTWARE SOLUTIONS uses Rapid Application Development and Iterative techniques to allow some work from one phase to overlap in duration with ongoing work in another phase. The typical high-level project activities and control processes are shown below. 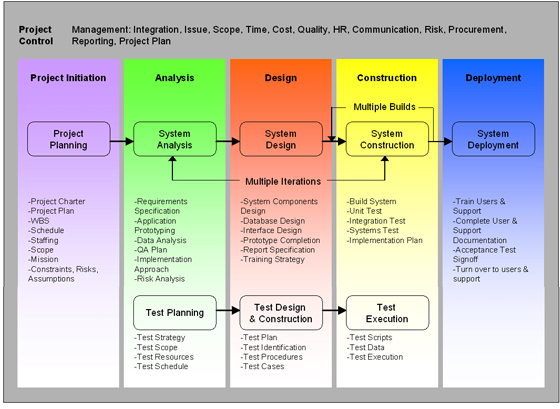 The colored columns represent the application development phases for the project while the gray frame represents the project controls used to manage the overall process. This framework is designed to ensure that both the Customer and INJ SOFTWARE SOLUTIONS understand what is required to be successful and to ascertain the current status of the project. There are several Project Planning and Control techniques INJ SOFTWARE SOLUTIONS uses to manage projects. These are proven management techniques that address project planning, status reporting, product quality, issue management, and change control. INJ SOFTWARE SOLUTIONS performs web application development projects utilizing the two most common frameworks in the market today: Microsoft .Net technologies and Java J2EE technologies. INJ SOFTWARE SOLUTIONS uses Microsoft ASP.Net together with C# and SQL Server to provide robust applications for our clients who prefer Microsoft solutions. 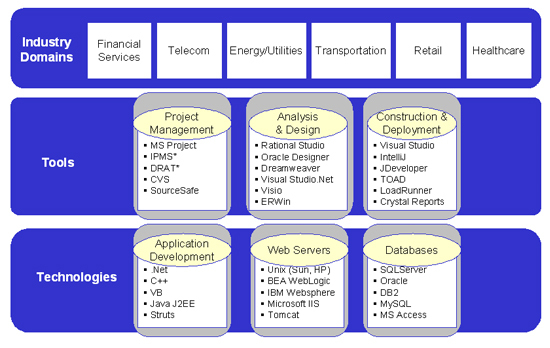 For clients who prefer the open-source paradigm, INJ SOFTWARE SOLUTIONS develops Java J2EE solutions on Apache/Tomcat, in combination with advanced messaging systems using JBoss, or alternatively using application servers such as BEA WebLogic or IBM Websphere to provide Java based solutions. We use XML to define our databases, providing for portability between SQL Server, Oracle or DB2 databases, depending upon client needs and preferences. INJ SOFTWARE SOLUTIONS recommends web solutions to clients in the majority of application development cases, but some business problems still lend themselves to client/server applications today. Client/server applications for customers are developed using Microsoft Visual C++, Visual Basic, C# or C++ on Unix, depending on requirements for operating system support, performance and maintainability. Legacy applications written for platforms that a client no longer plans to support often need to be ported to a new environment at minimal cost. INJ SOFTWARE SOLUTIONS has experience and processes to migrate applications from mainframe, client/server, Unix, Microsoft and other environments to current state of the art platforms including .Net and Java J2EE. Business rules discovery, existing process and transaction flows are captured, documented, migrated, tested and implemented on the desired platform. A sampling of tools, technologies and industry domains is shown below.